296 pages | 2 B/W Illus. This latest volume in the World Yearbook of Education series examines the relationship between assessment systems and efforts to advance equity in education at a time of growing inequalities. It focuses on the political motives behind the expansion of an assessment industry, the associated expansion of an SEN industry and a growth in consequential accountability systems. Split into three key sections, the first part is concerned withthe assessment industry, and considers the purpose and function of assessment in policy and politics and the political context in which particular assessment practices have emerged. Part II of the book, on assessing deviance, explores those assessment and identification practices that seek to classify different categories of learners, including children with Limited English Proficiency, with special needs and disabilities and with behavioural problems. 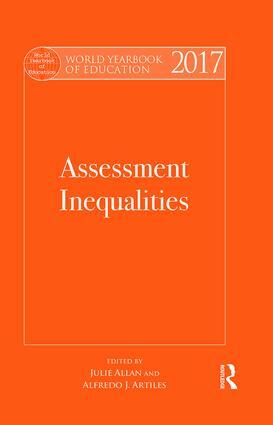 The final part of the book considers the consequences of assessment and the possibility of fairer and more equitable alternatives, examining the production of inequalities within assessment in relation to race, class, gender and disability. Discussing in detail the complex historical intersections of assessment and educational equity with particular attention to the implications for marginalised populations of students and their families, this volume seeks to provide reframings and reconceptualisations of assessment and identification by offering new insights into economic and cultural trends influencing them. Co-edited by two internationally renowned scholars, Julie Allan and Alfredo J. Artiles, World Yearbook of Education 2017 will be a valuable resource for researchers, graduates and policy makers who are interested in the economic trends of global education assessment. Julie Allan is is Professor of Equity and Inclusion and Head of the School of Education at the University of Birmingham, UK, and Visiting Professor at the University of Borås in Sweden. Alfredo J. Artiles is Associate Dean of Academic Affairs and the Ryan C. Harris Professor of Special Education at Arizona State University’s Mary Lou Fulton Teachers College, USA. Examining a different topical subject each year, these fascinating books put forward a wide range of perspectives and dialogue from all over the world. With the best and most pivotal work of leading educational thinkers and writers from 1965 to the present day, these essential reference titles provide a complete history of the development of education around the globe. Available individually or in library-ready sets, this is the indispensable atlas of education, mapping ever changing aspects of theory, policy, teaching and learning.